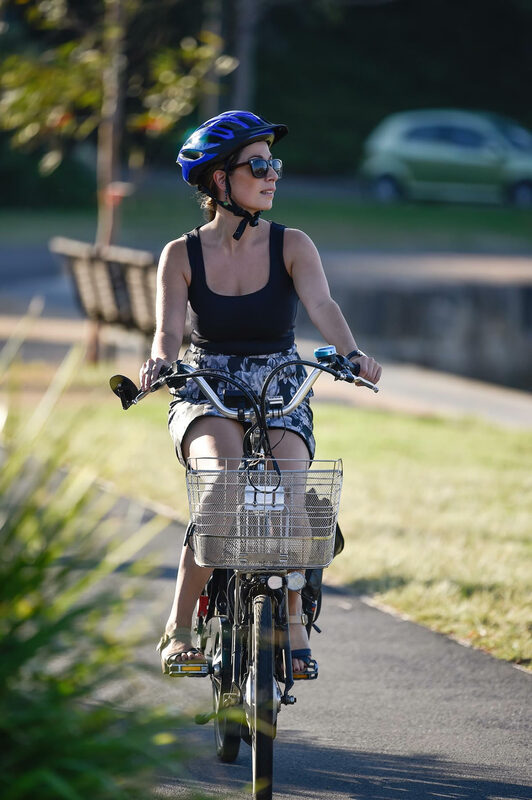 You might be averse to Lycra – others’ or your own – but don’t let that spoil your opportunity to discover Sydney by bike. Cycling is a one-of-a-kind way to experience Sydney. It enables you to explore more of its landmarks than walking does but it’s also a more intimate way to experience Sydney than car. 2017 findings from CDM Research shows cycling participation in Sydney increased significantly between 2016-2017. At Song Hotel Sydney, when your itch to pedal flares, nearby bike hire facilities are just one of the many problems you won’t have. Bike trails is another one. The glorious tangle of popular routes coursing inside and outside urban Sydney uncover dusky skylines, photogenic landmarks and rolling landscapes. Your biggest pickle might be choosing which bike ride to take but here are four that will make your visit memorable. Centennial Park, a one-time catchment of creeks, swamps, springs, sand dunes and ponds, is a picturesque recreational area in Sydney’s eastern suburbs. Celebrating its 130th birthday this year, the 230-hectare park is popular with dog walkers, horse riders, pedestrians and cyclists who enjoy the landscape, serenity and fresh air. Constructed on Gadigal country, the park is renowned for its storied history. It has been the site of many major happenings including military occupation emerging out of World War II, inauguration of Australian Federation and various protests revolving around public and private use of the park. For low-key pedalling, the various bike paths within the park make it an attractive place to visit. Kids are nuts about the learner path. Numerous alternative mixed paths wind amongst surrounds of reedy ponds, formal gardens and vibrant fauna. Grand Drive Cycleway too, is a dedicated 3.8 kilometre bike path for all levels. There are decisions however. Once you hire your bikes on site, you’ll need to decide how to schedule for the likes of park activities/events and picnicking with family and friends. The Sydney Foreshore Loop, a 13 kilometre ride by many of Sydney’s best Harbourside jewels, is a fun up-close way to see how prominently water shapes Sydney’s identity. But the all-ages crowd that pedals the circuit knows it’s about more than prime water views. As you amble through the edges of Balmain, Glebe and Pyrmont, you’ll encounter historical homes, inviting parkland, storied back streets and many major tourist destinations. The Museum of Contemporary Art, Pirrama Park and The Riverview are all worth dismounting for. In fact, with arts, culture, entertainment and dining experiences in spades around Sydney’s waterside, full-day bike hire makes good sense. The Narrabeen Lagoon Trail, an uninterrupted 8.4 kilometre bike track set amongst Narrabeen Lakes, formally opened in 2015 but it’s quickly making a name for itself. Ringing a vast lake popular with watersports and fishing crowds, the largely-flat track turns through humming bushland abuzz with wildlife. Cyclists, walkers and joggers flock on weekends to immerse themselves in Narrabeen Lakes’ natural beauty and to enjoy the cafes serenely stationed by the water. You’ll find plenty of bikes at Narrabeen Lakes Bike Hire and the beach next door to the lake means you have yourself a fully-blocked day. Sydney Olympic Park is a cycling mecca of, well, Olympic proportions. It features 35km of cycleways but also a fun mix of shorter scenic routes that take about an hour each to complete, at holiday speed. The Olympic circuit, which takes off from Olympic Station, is the trail to take to see snapshots of Sydney Olympic Games history, including the Olympic venues, Cathy Freeman Park and the Brickpit Ring Walk. The River Heritage Circuit showcases wetlands, a naval heritage precinct and panoramic views of the entire park. The Parklands circuit, an oasis for nature fans, is a great way to see Lake Belvedere, the Badu Mangroves boardwalk and a shipwreck that’s growing older in the bay. Olympic Park is a wonderland of arts and culture, sports experiences and entertainment too, so biking works well as a tie-in to a day-long visit.